Sanremo Roundtable: Which is better, sprint or breakaway? Every season, Milano-Sanremo stymies fans, journalists, and riders with its unpredictability. This fickle first monument of the classics season is sometimes a pure bunch sprint, and other years it favors a bold attack over the final climb of the Poggio. So what can we expect from Saturday’s race to the Italian coast? Let’s roundtable! Tell us about your favorite past edition of Milano-Sanremo, and what needs to happen in 2019 for the racing to live up to that high standard? Fred Dreier, @freddreier: I’m a sucker for the small group finales at Milano-Sanremo, such as the 2012 showdown between Simon Gerrans, Fabian Cancellara, and Vincenzo Nibali, as well as the 2017 battle between Peter Sagan, Michal Kwiatkowski, and Julian Alaphilippe. I’ll go ahead and vote for the 2017 edition as the most exciting since Kwiatkowski’s winning sprint combined some real brain and brawn. 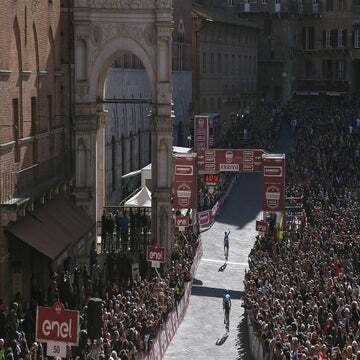 Kwiatkowski didn’t skip his pulls, a-là Simon Gerrans, in the crucial flat section from the bottom of the Poggio to the Via Roma. And in the sprint, he just seemed to be a bit smarter. He let a small gap open to Sagan in those final meters, which likely persuaded Sagan to lead out the sprint. This year, I can envision a similar front group containing Alaphilippe, Matteo Trentin, and perhaps Alejandro Valverde attacking over the climb and coming to the line together. Spencer Powlison, @spino_powerlegs: The 2008 edition of Milano-Sanremo showcased vintage Fabian Cancellara. He led the charge over the Poggio when Philippe Gilbert attacked. He prowled the select group that made it down the final descent. Everyone knew he was the man to beat, but they couldn’t stop him. Better still, Cancellara surprised them all with an audacious attack with three kilometers to go and all the chasers could do was watch him raise his arms in victory as they fought for scraps. I think there are a lot of sprinters’ teams that would hate to see a replay of that unpredictable drama. So, if we want a thriller like the 2008 edition, a few key sprinters, such as Fernando Gaviria and Elia Viviani, will need to be on a bad day, giving their workhorses freedom to ride for themselves. Andrew Hood, @eurohoody: I dig those over-the-Poggio attacks based on pure power and panache. Cancellara’s win and near-wins stand out. The three-up bike stab featuring the stars of today’s generation — Sagan, Kwiatkowski, and Alaphilippe — was superb. So why not a bit of both? Let’s see someone gap the sprinters and then let the chase begin. Fred: OK, I’m the new sport director at Deceuninck-Quick Step, and I’m in charge of winning Milano-Sanremo. Lucky me! I have my Tim DeClercq and Yves Lampaert ride the front in the final 100km and protect my two-star riders (Alaphilippe and Elia Viviani). I let Philippe Gilbert attack on the Cipressa, and send Alaphilippe to counter any moves on the Poggio. If the group stays together, I tell Max Richeze to fire his afterburners at 500 meters to go and lead Viviani right up to the line. Spencer: I like how specific Fred’s plan is, but as we all know, cycling rarely goes according to plan. Instead, I’d counsel my riders to hold their fire until after the Poggio. Yes, an attack on the final climb makes for good TV, but it rarely works. Instead, if a rider has solo ambitions, send them up the road in the final 5km after the descent to force another sprint team to chase, keeping my sprinter fresh for the final rush to the line. Andrew: Key to this race is keeping the powder dry, but knowing when to take your shot. A DS can only provide so much coaching from the car in the final explosive kilometers. An MSR winner needs a bit of luck, but it’s also a race won on instinct. If I were a DS, I’d tell my riders to stay close to Sagan, and if you’re feeling jumpy, go for it. What is your favorite type of Milano-Sanremo finale — a sprint finish or a breakaway, and why? Fred: Again, I like the small group breakaways, because it combines the thrill of the will-they-or-won’t-they with the unpredictable drama of a sprint. Spencer: I know I just fawned over Cancellara’s solo victory, but in general, I prefer the sprint finish. Look, every other monument, and nearly every other classic favors attackers or punchy climbers. I like that Sanremo is an opportunity for a different kind of rider. We’d all be grouchy if every monument finished in a bunch sprint, wouldn’t we? Andrew: I simply love the race because it’s impossible to predict. An edition at least without a cheeky move over the Poggio is a bit disappointing, however. And I’d love to see someone go all-in with a long bomb from the Cipressa — that hasn’t been done in decades, at least not successfully. Who is your top pick to win on Saturday, and who would you name as a dark horse to steal the day? Fred: My pick is Elia Viviani. I think this year’s edition has too many sprinters for a solo move to stick, and Viviani has been building up to this for the past two seasons. My dark horse is Matteo Trentin. He’s always feisty. He’s strong this year, and he’s versatile enough to make some big moves in the final kilometers. Spencer: I think Fernando Gaviria (UAE Team Emirates) will finally earn his big victory on Saturday. He’s got a veteran support rider in Alexander Kristoff — a man who’s won here before — and he’s had a smooth run into the spring without any of the freak crashes he suffered last season. My dark horse is Sam Bennett (Bora-Hansgrohe). You might think he’d be at Peter Sagan’s beck and call, but the former world champ has been sick recently, and I don’t think he’ll be a factor this year. Bora would do well to let Bennett ride free at Sanremo, because he’s on good form with two Paris-Nice stage wins in the bank. Andrew: The sprints have been heated this spring, but Viviani looks most consistent if it’s a group finale. And because DQS is so strong, Alaphilippe is the man to try to go clear over the Poggio. I’d love to see someone TT away from the group, pure power Cancellara-style — perhaps Tom Dumoulin (Sunweb) could be that man. Sanremo Roundtable: What happened with Sagan?